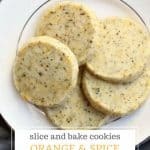 Orange spiced tea cookies combine the flavor of tea with citrus in this lovely slice and bake cookie recipe. 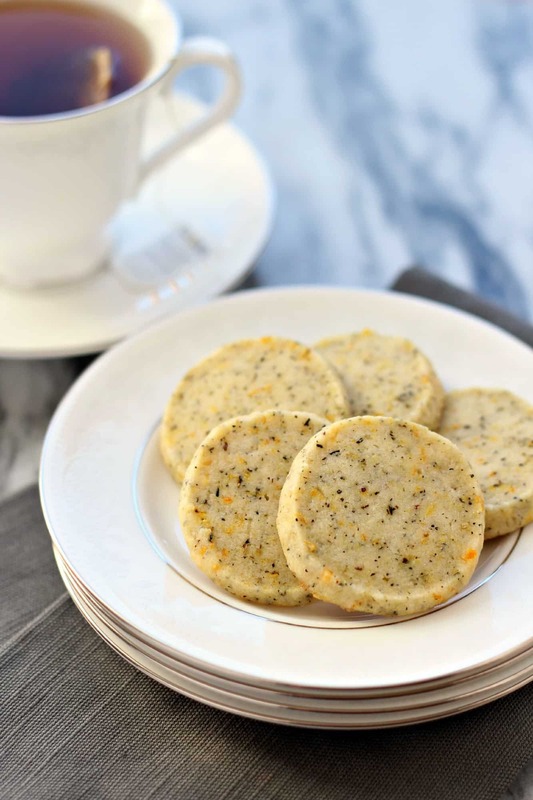 Orange spiced tea cookies are a delicate dessert packed with flavor. Today I started with Good Earth’s Sweet & Spicy herbal and black tea then incorporated it into this slice and bake cookie to create orange spiced tea cookies. The bold flavors of cinnamon and orange are highlighted in this herbal tea and both flavors transfer well to baked goods. I increased the orange with the addition of some orange zest and juice while adapting a tea cookie recipe from Krystina Castella’s book, Crazy about Cookies (page 119). The aroma in the kitchen when these cookies were baked was almost as much of a treat as eating the cookies! The orange and spices were a bright scent, one that I hope to recreate again. 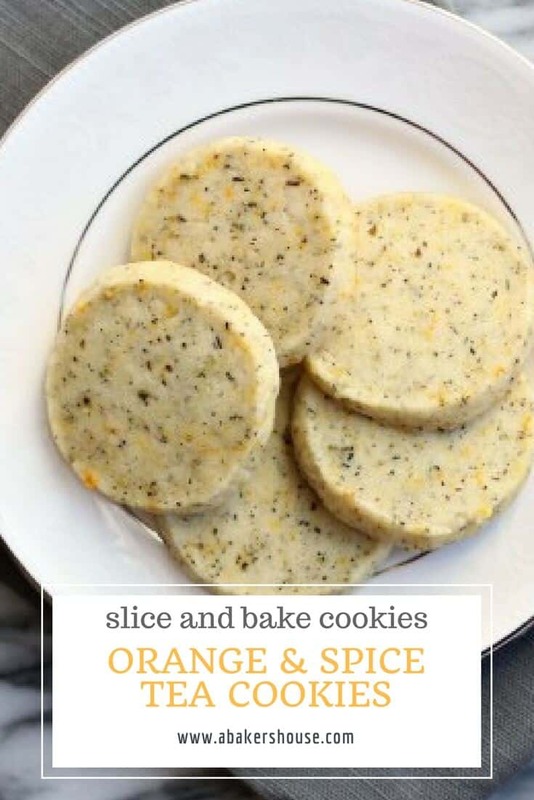 This is a simple orange spiced tea cookie, perfect to enjoy with a cup of coffee or tea. 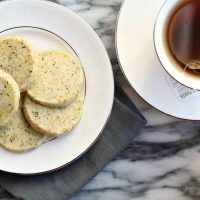 Tea cookies are perfect for wedding showers, baby showers, graduation parties, or Mother’s Day. Need more dessert recipes? 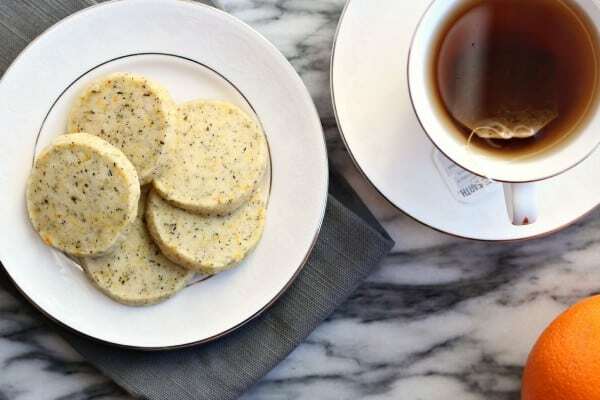 Try these Lavender Shortbread Cookies, Lemon Ricotta Cookies, or Maple Cookies. Welcome to #CreativeCookieExchange for the month of March where the theme is tea and coffee. We want to WAKE UP from winter with these flavors! Won’t you join us? Baking with tea is a creative way to introduce new flavors to your baked goods. Teas come in so many varieties — simple black tea, green tea, spice teas, fruity teas,…the list goes on. Recipe adapted from Crazy about Cookies, page 119. Recipe by Krystina Costella. Combine the flour, salt, and tea. Tea from tea bags should be ground finely and won't need additional processing. Loose tea leaves may need to be ground before adding to the dry ingredients. In a stand mixer (or using a hand held mixer) cream the butter and sugars together until light. Add the zest and orange juice. Mix until well blended. Make a log shape with the dough, wrap in plastic wrap and refrigerate for 30 minutes. Preheat oven to 350 degrees F. Slice cookie dough in 1/4 inch slices. Place on a parchment lined cookie sheet. Bake for 10-12 minutes. Cool on a wire rack. 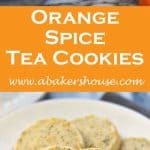 Pin this recipe for Orange Spiced Tea Cookies for later! The group has been busy baking– here are our creations this month. Want to join in the fun? Become a host with us. Just contact Laura at [email protected] and she will get you added to our Facebook group, where we discuss our cookies and share links. Fantabulous idea! There was a Good Earth restaurant when I attended UCLA (many moon ago.) The scent of the spiced tea rushed into my head…So glad the tea is still around and sooo glad you shared this scrumptious recipe, Holly! I do believe that baking with tea is going to be my new thing, Holly! It’s wonderful, isn’t it? I love the flavors in your orange spice tea cookies, especially the extra flecks of orange zest. Lovely! A real definition of “tea” cookies! Great idea to cook with tea, and the Good Earth flavor that you used is one of my favorites! You know I like this flavor of Good Earth’s tea so much that I haven’t tried any others– I need to branch out! I can only imagine how wonderful the aroma must have been. Orange and cinnamon go very well together, I’ve tried this combination in breads and now you have almost pushed me to try it in cookies as well! Yes, the aroma was worth it! Hope you find time to try a similar cookie or more bread with these flavors again soon. How gorgeous are those!! Love the tea and orange flavor together!! Thanks, Tara! I loved the cookies the group came up with this month! Stunning cookies, Holly. Oh how I wish I could taste one or two ! And No Eggs! I can make these for my vegan MIL! Score! Thanks for pointing out the “no egg” aspect of this cookie, Ansh. I’ve been meaning to add that type of detail to my recipes so I can list them separately by type of diet. I find that so helpful on other food blogs and haven’t done it myself! Wonderful recipe Holly! Love the looks of these delicate little cookies. Thanks, Karen, I like the ease of a slice and bake cookie. In theory I could just slice a few at a time and ration the cookies for myself but I always make the whole batch and happily eat my way through them! 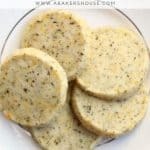 Perfect shortbread for tea! I’ve used Earl Grey in cc cookies that were fabulous . These look equally as good! Thanks, Holly! Earl grey is next on my list, thanks, Abbe! Huge fan of home baked cookies and I tend to use lots of flavoured Tea bags in my recipes. I currently have some Cinnamon Orange Tea bags that I will definitely be giving a whirl in this recipe! Some wonderful recipes in the Creative Cookie Exchange list. Perfect- glad you have some tea bags that sound just right for these cookies. Thanks for stopping by! Beautiful cookies and the flavor it must be incredible. Your cookies sound and look is good, I love orange in cooking and with tea sounds like a good idea. Thanks! This herbal tea had a perfect flavor profile for baking. It’s wonderful as is and just as nice in a cookie. Holly, these sound amazing and they look adorable! I love the orange flecks! Thanks, Karen, I was happily surprised by how strong the orange flavor was in the finished cookie. Sometimes citrus fades when baked but this was just right. These cookies look delish! I love orange and tea flavors together! I like to dehydrate orange slices to stick in my tea even. Pinning these! I thought it was a great theme too! What a great bunch of cookies! I love how you can see the little pieces of orange and tea in your cookies. I also love the smell of cookies baking, but these take it to a whole new level. I really enjoy all the different teas but I seem to make coffee more often. These lovely cookies will give me an excuse to get the tea for these cookies and then have it around to enjoy in the afternoons instead of coffee. What a creative and delicious looking cookie recipe. I love citrus food. Pinned. Those look SO GOOD. I am someone who is solidly in the coffee flavored dessert camp but quite a few of you have me second guessing that! Oh dear, now that you’ve mentioned coffee flavored desserts my mind is going in that direction…yum!